Developer WayForward has been known for digging into gaming's past with games like DuckTales Remastered and Contra 4. 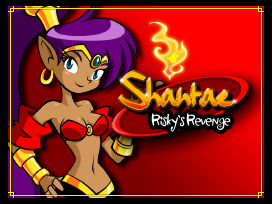 But now the studio is about to dig into its own past by re-visiting Shantae: Risky's Revenge. The second installment of the Shantae series is set to hit Steam next week with Shantae: Risky's Revenge - Director's Cut. Wayforward made the announcement on their Twitter account yesterday, but added no other details in terms of features. Since then, the developer has slowly begun to divulge some of what the Director's Cut will contain, adding another tweet that reveals a special Magic Mode. Magic Mode will give Shantae a wardrobe change that cuts her magic consumption in half, but has her take double damage, adding to the game's challenge. Risky's Revenge is the sequel to the original Shantae, which was released on Game Boy Color. The second game in the series was released in 2010 as downloadable title for the Nintendo DS and later released on iOS. There is no active Steam listing at this time for Shantae: Risky's Revenge - Director's Cut, but it will release on July 15 for $9.99. Ozzie Mejia posted a new article, Shantae: Risky's Revenge - Director's Cut coming to PC next week. That actually looks pretty fun!